TwitterDJ, an application created by m-inus and based on a conceptual idea of Richie Hawtin, received a lot of public attention even before the application was released and made general available. 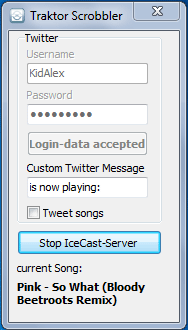 TwitterDJ comes with an almost 10 minutes long video explaining the installation and configuration. As I saw the video my first thought was, that there must be an easier way to get the track information from Traktor into a Twitter account. 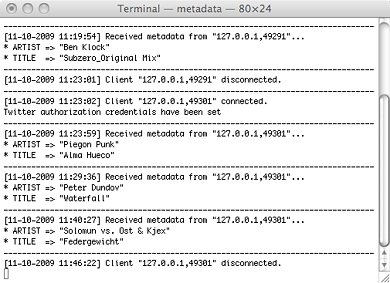 And yes, there are easier ways, one is provided by the Metadata Listener/Tweeter application which was developed by Traktor user Markku Uttula, also known as DiscoNova in the Traktor user forum. 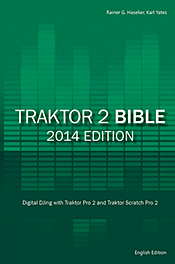 The second tool, Traktor Scrobbler, was devloped by Traktor user Alexander Zigelski, also known as DJ Ali in the Traktor user forum. Metadata Listener/Tweeter runs in a Windows console window or in a Mac Terminal window respectively, as shown in the next figure. Both tools are highly recommended and are a better choice, if you want to tweet your sets the easy way.